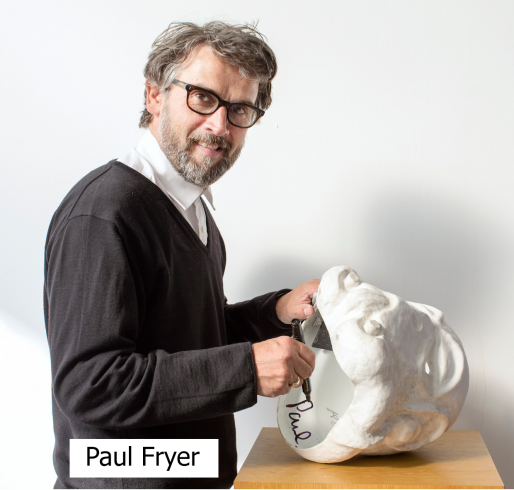 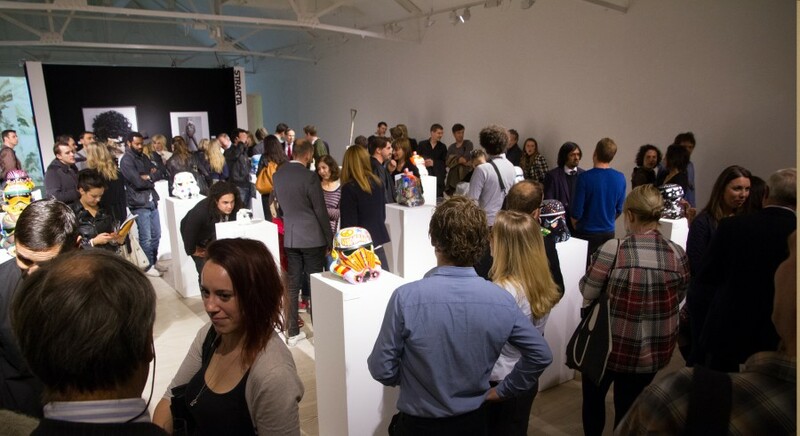 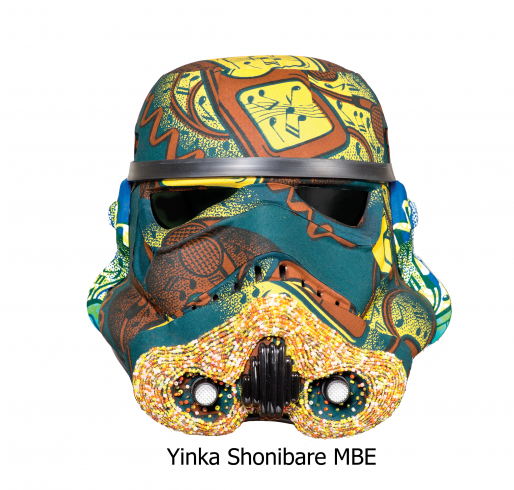 A brand new selection of helmets are now available to buy online through Paddle8 – please visit https://paddle8.com/auction/art-wars/ for further details. 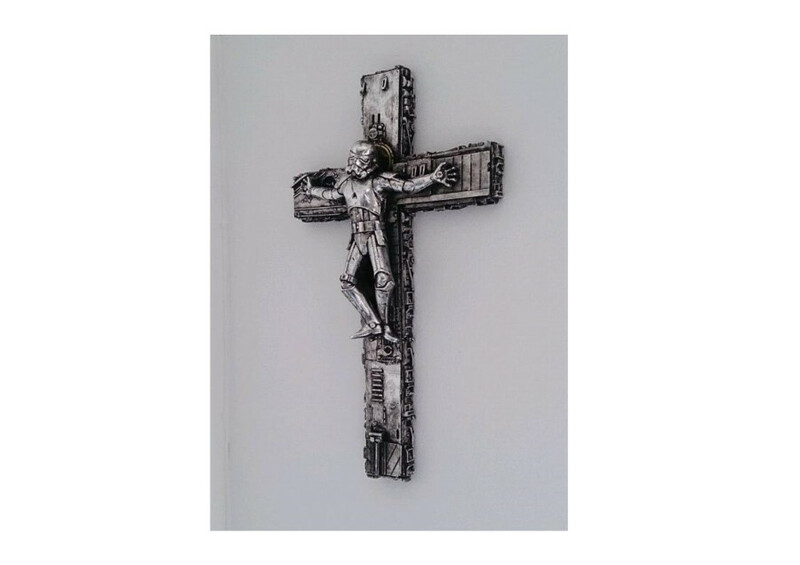 Bidding will close on May 25th at 5:00 PM EST. 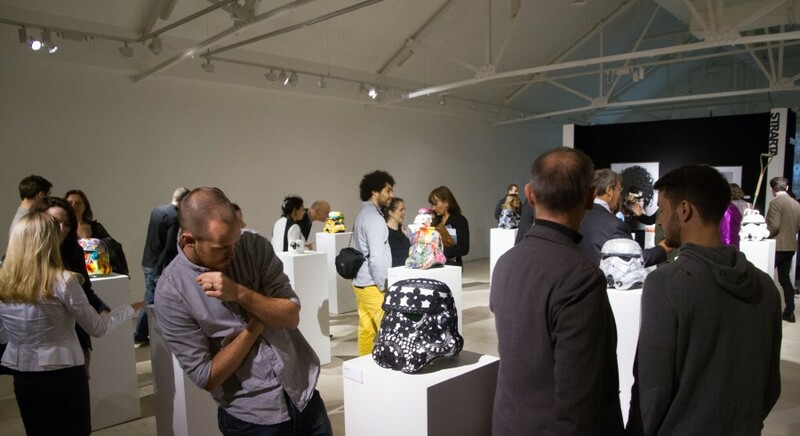 Art Wars is pleased to partner with Paddle8 for our online charity auction. London-based art initiative Art Wars travels to Miami and Los Angeles this December to unveil 20 brand new works by emerging and established artists. 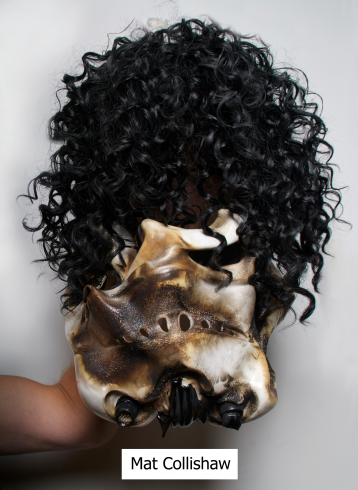 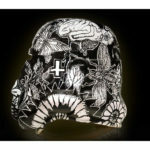 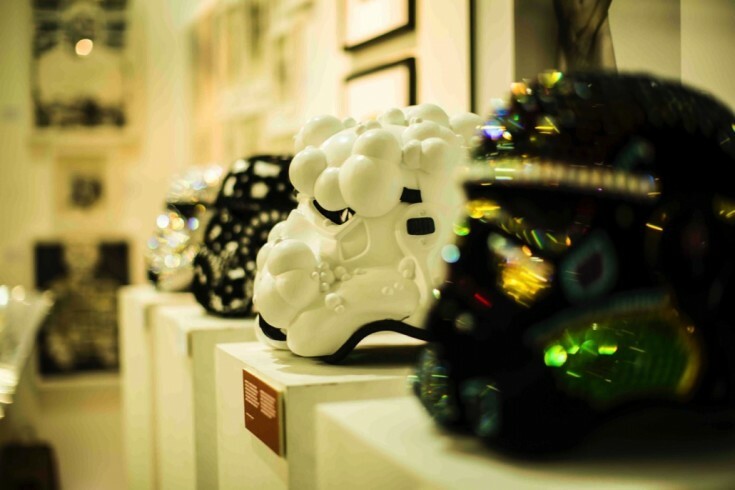 Eight of the helmets will be unveiled at the Red Dot Art Fair as part of Miami Art Week (6 – 10 December). 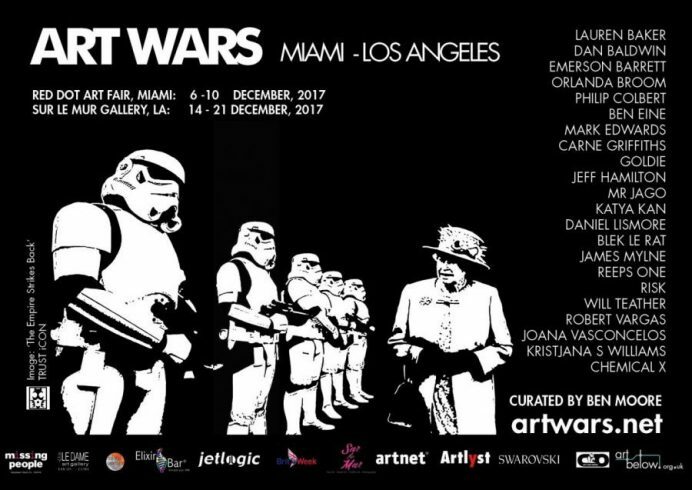 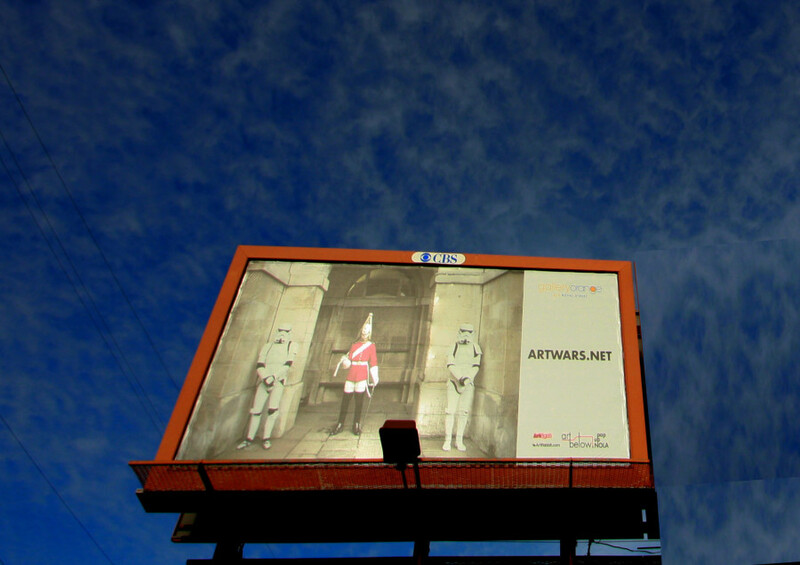 Then to coincide with the opening of Star Wars ‘The Last Jedi’ the entire collection will go on show at Sur Le Mur Gallery (SLM) in West Hollywood Los Angeles where Art Wars curator Ben Moore has teamed up with SLM gallery director Megan Philips to add some of LA’s finest artists to the mix. 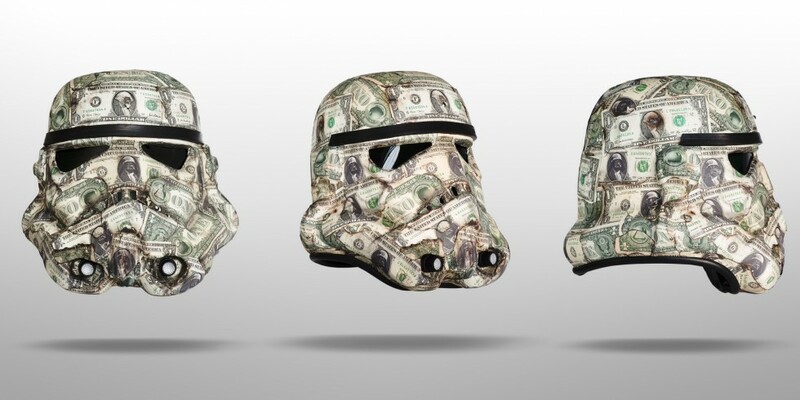 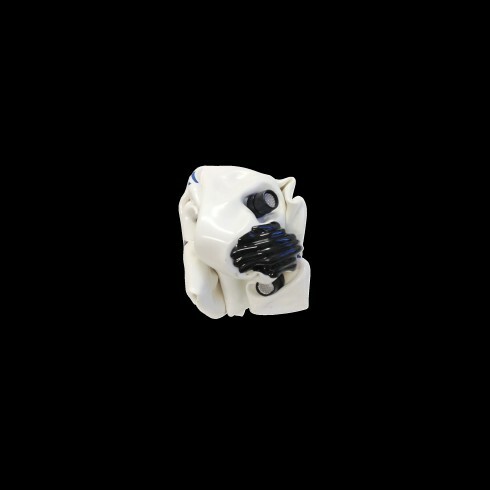 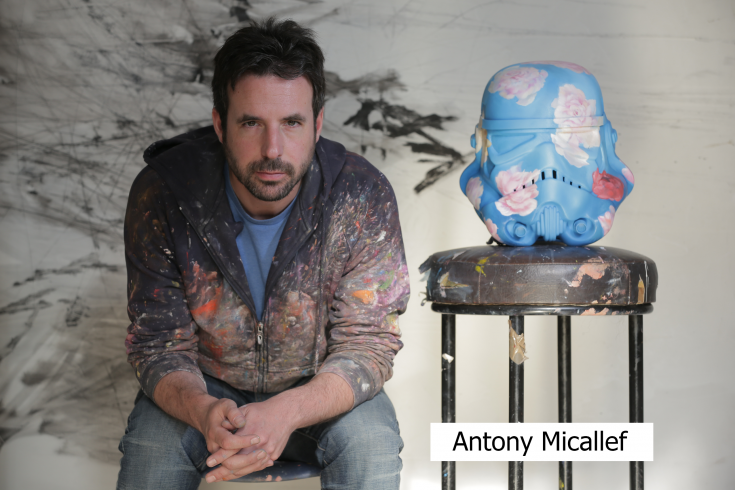 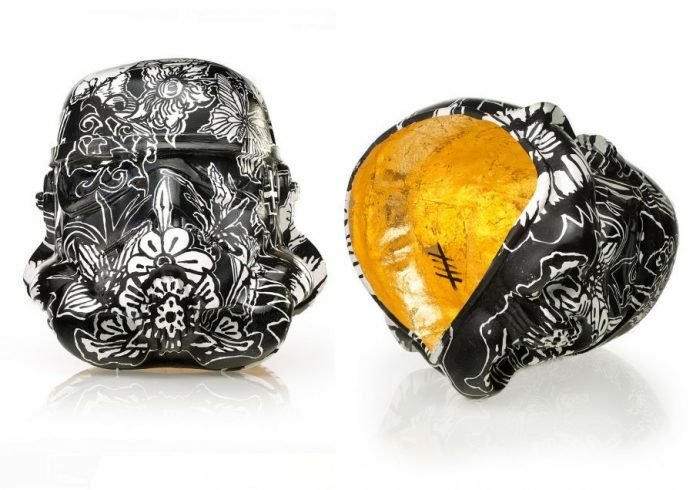 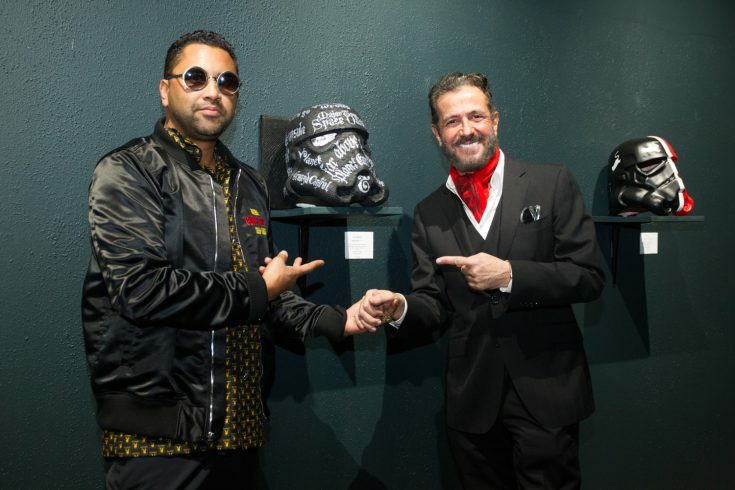 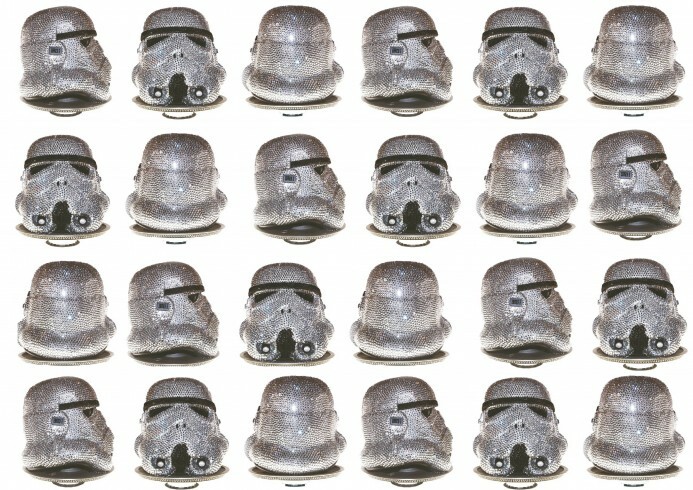 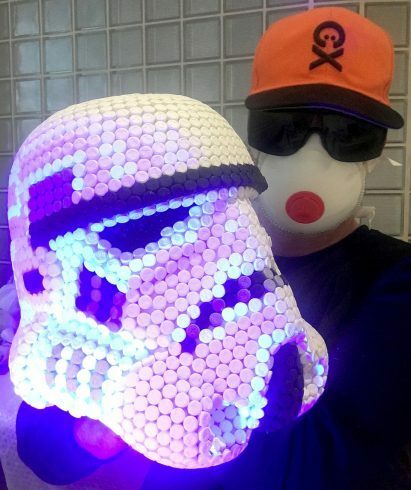 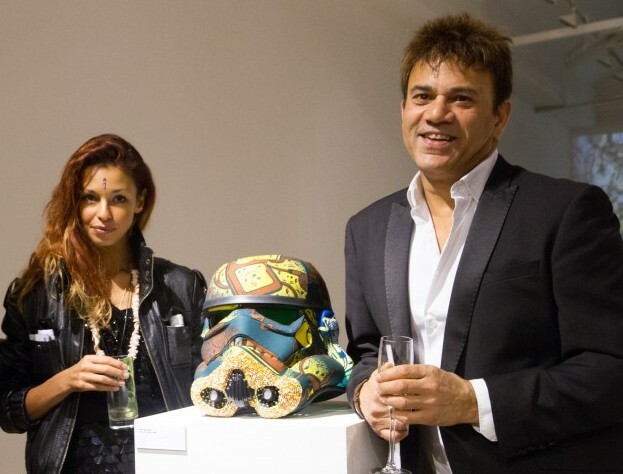 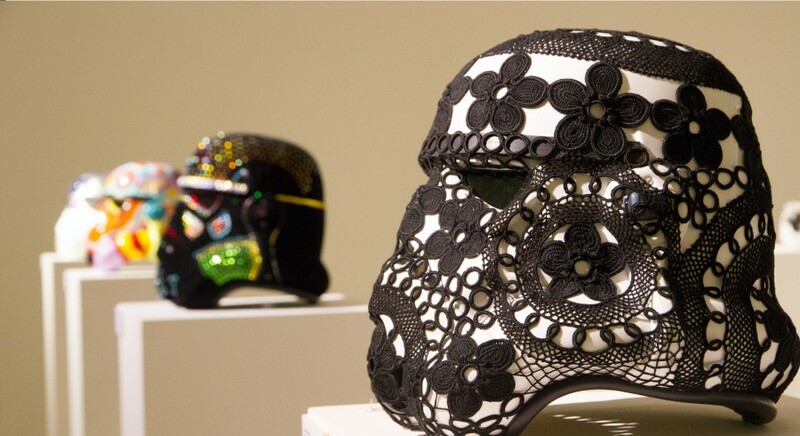 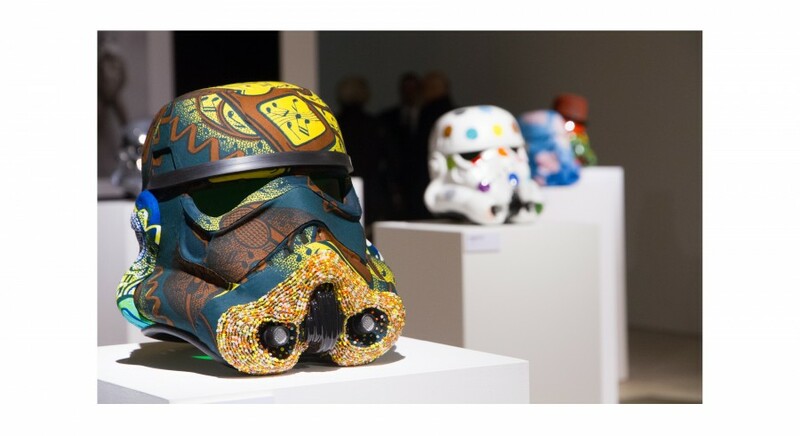 To coincide with the launch of the latest Star Wars film Rogue 1 – eight emerging and established artists, including Sir Anish Kapoor, have each embellished a Star Wars stormtrooper helmet with a unique design. 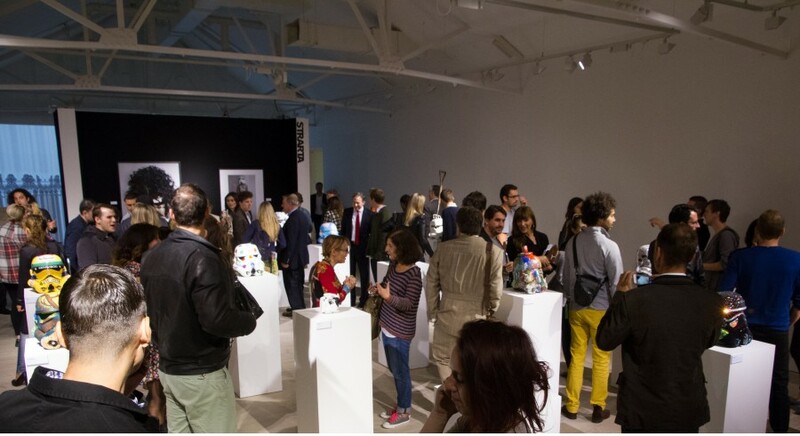 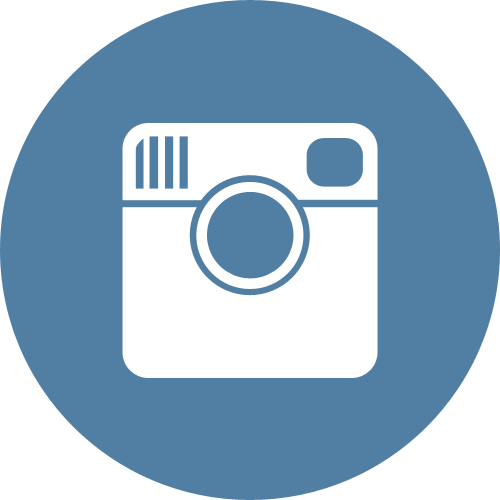 Venue: Spies Society Members Club, South Place Hotel, 3 South Place, Moorgate, London EC2M 2AF. 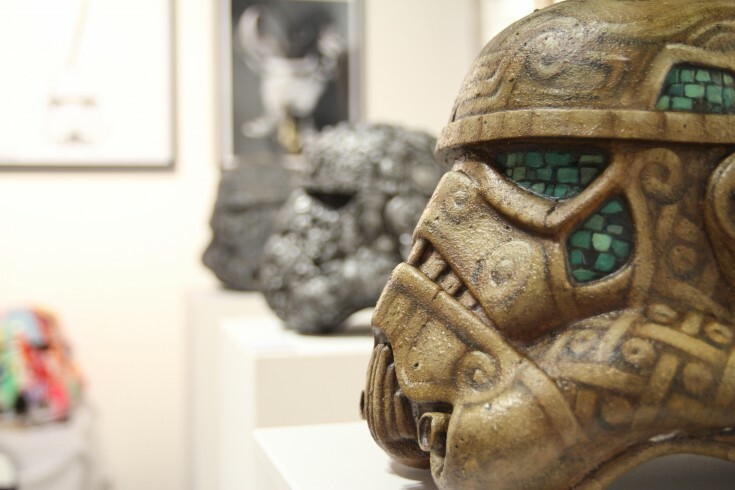 January 27 – 31, 2016 | L.A. Convention Center, WEST HALL. 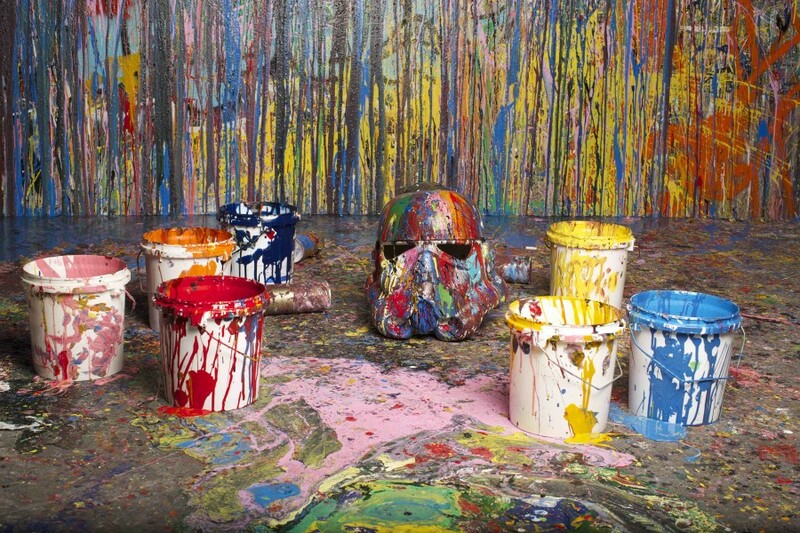 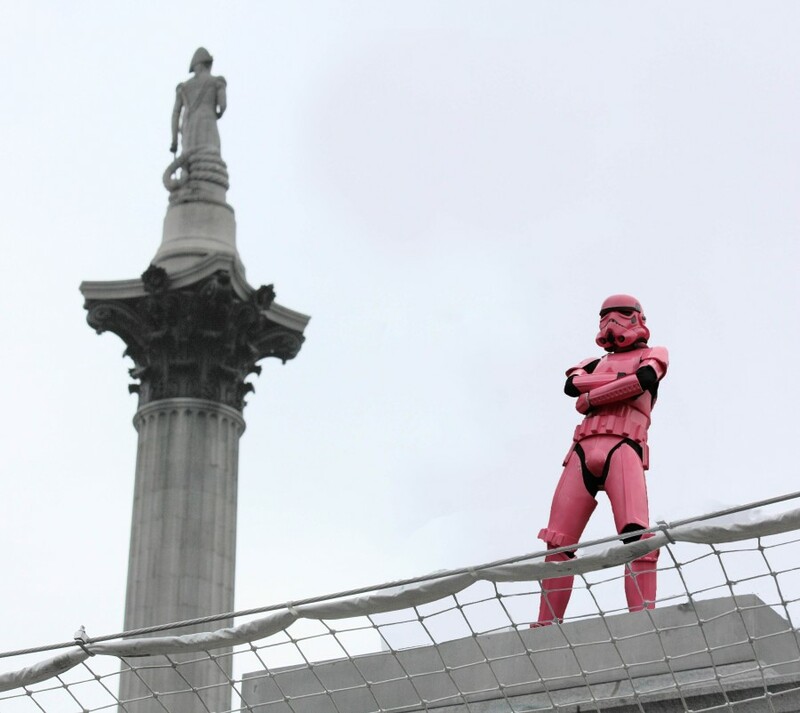 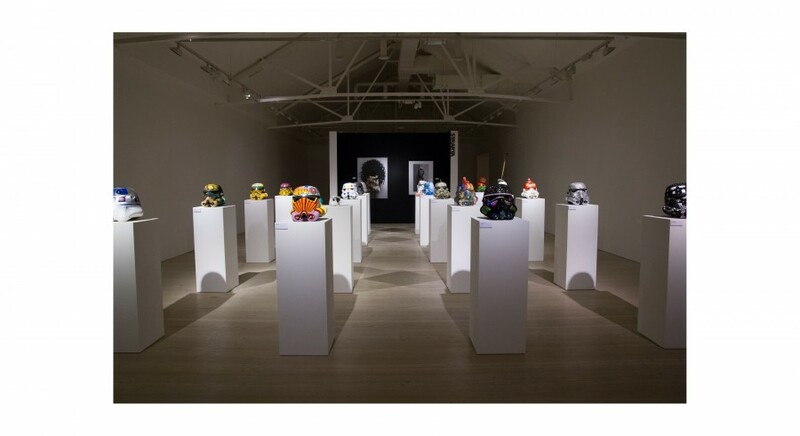 As the hotly-anticipated latest addition in the Star Wars franchise opens in cinemas across UK, London based art curators Ben Moore and Sara Wade unveil a retrospective exhibition ‘Art Wars’ in the heart of Mayfair. 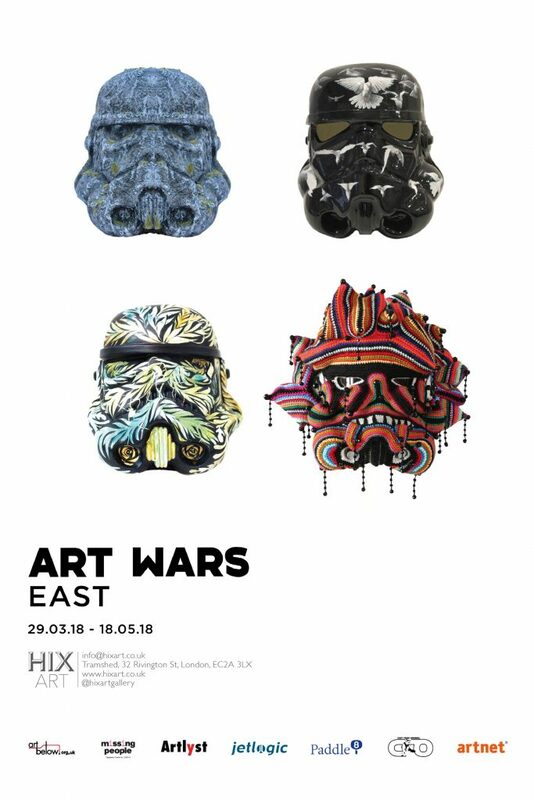 Opening on 17th December, at 18 Hertford Street, Mayfair, ‘Art Wars Mayfair’ will give visitors insight into nearly ten years of art in an ongoing collaboration with some of the best minds in the art world as they fuse Star Wars culture with their own artistic twist and trade mark style. 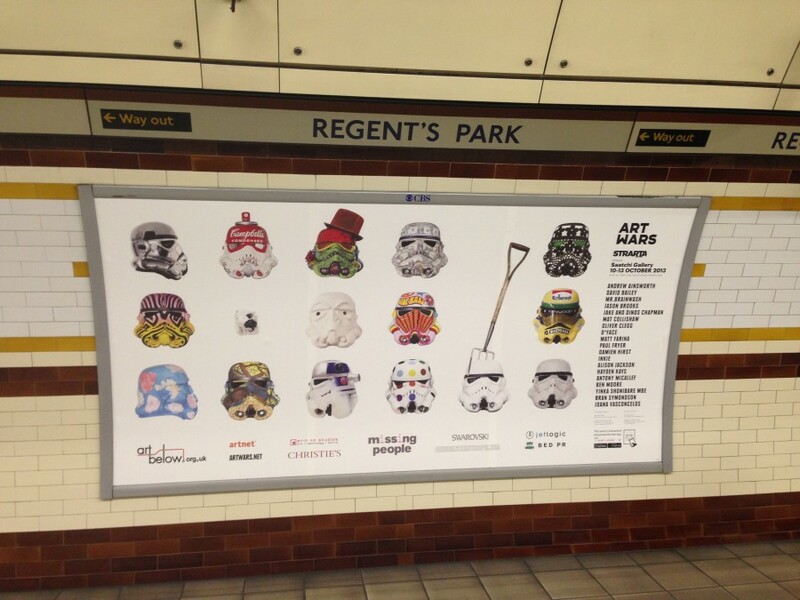 Artists include Mr.Brainwash, James Mylne, Hayden Kays, Jake and Dinos Chapman, Alison Jackson and Joe Rush. 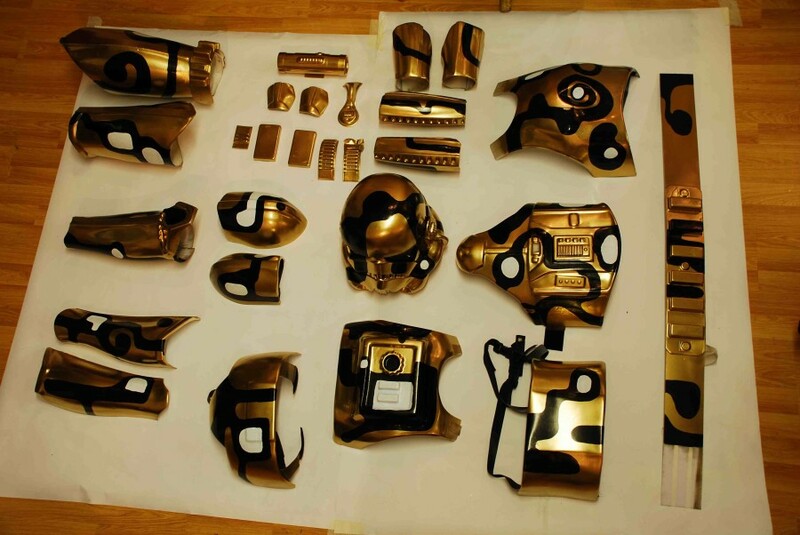 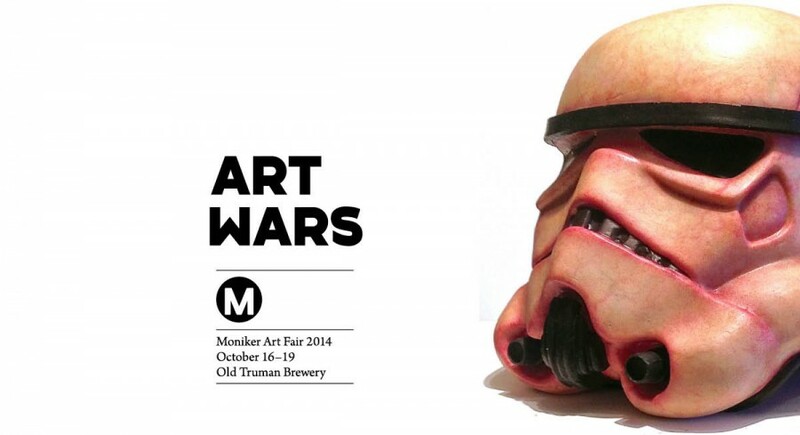 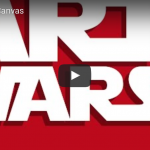 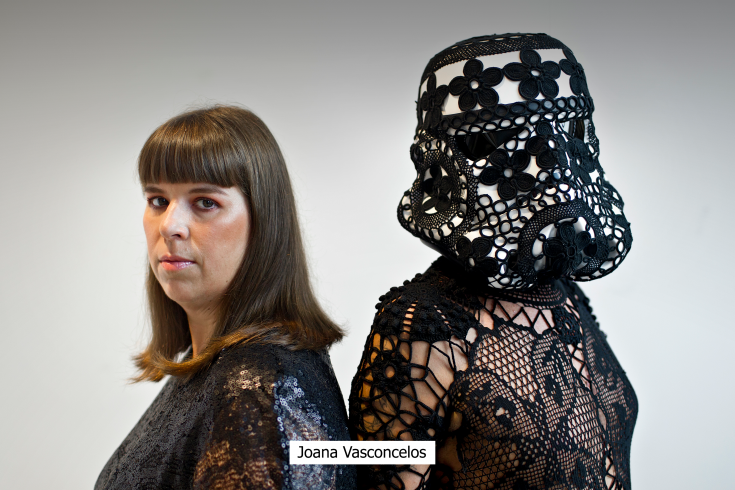 ART WARS SWEDEN, 17th January – 29th March 2015. 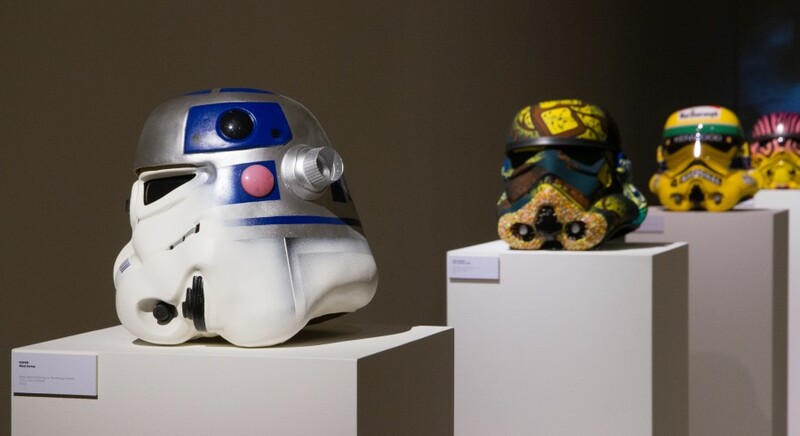 3:e Våningen Art Centre, Carnegie sugar refinery, GOTHENBURG. 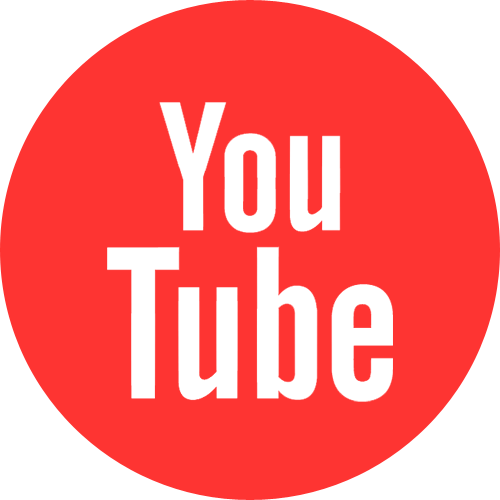 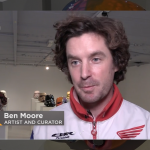 Curated by Ben Moore and Olof Persson. 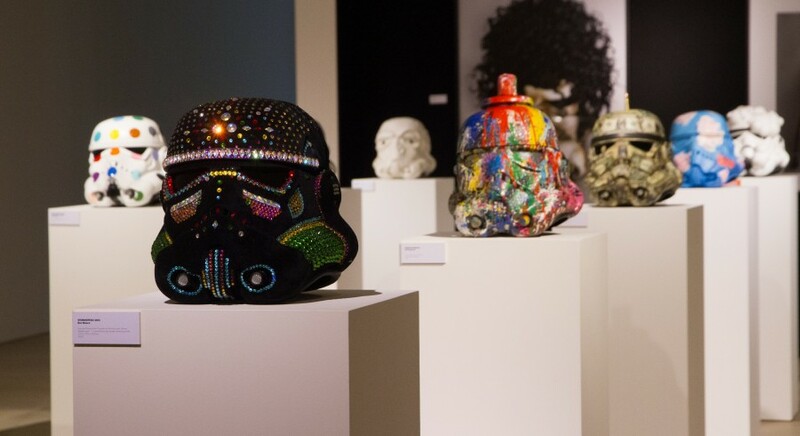 A selection of new artists, including Mr.Brainwash, Inkie, RYCA, Joe Rush, Elmo Hood, Schoony, Nancy Fouts and Craig Davison have transformed ‘the dark side into the art side’ to be unveiled at this year’s Moniker Art Fair. 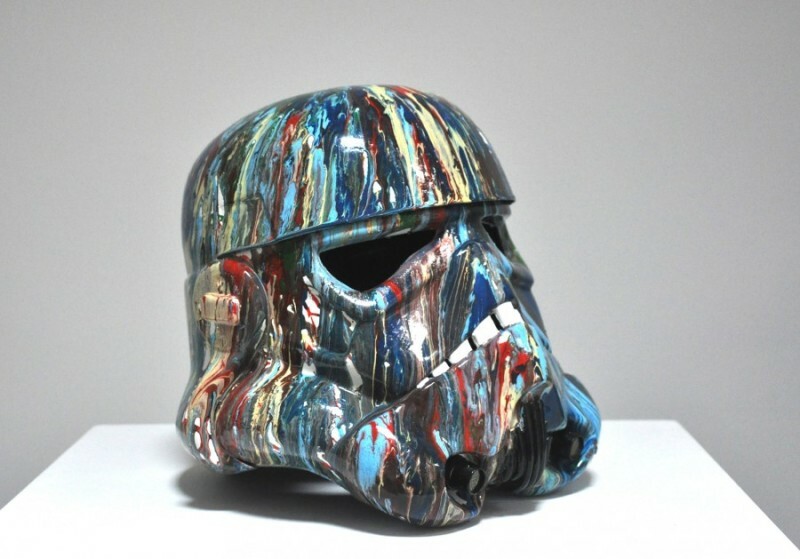 Curated by Ben Moore these artists have been specially invited to fulfil the ‘urban vibe’ that is epitomised in the Moniker Art Fair. 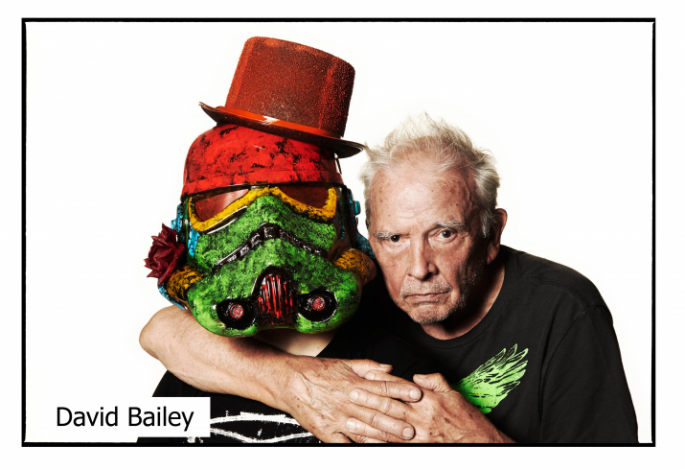 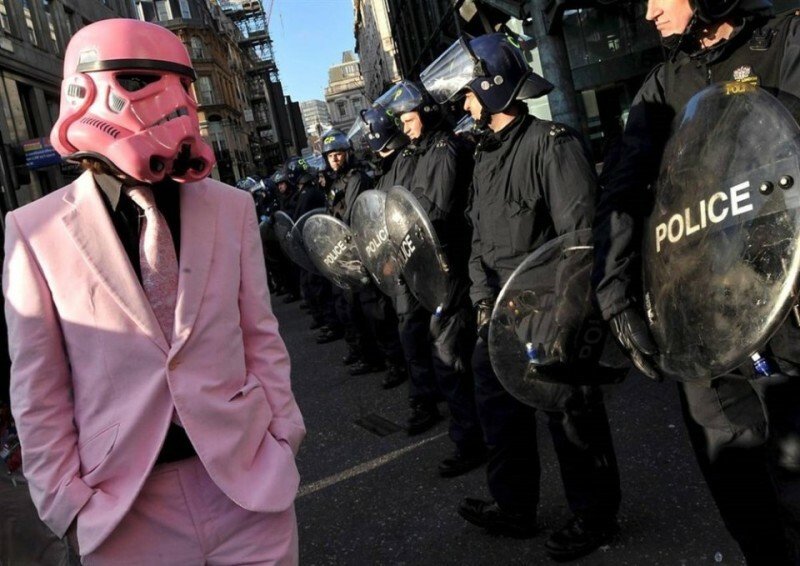 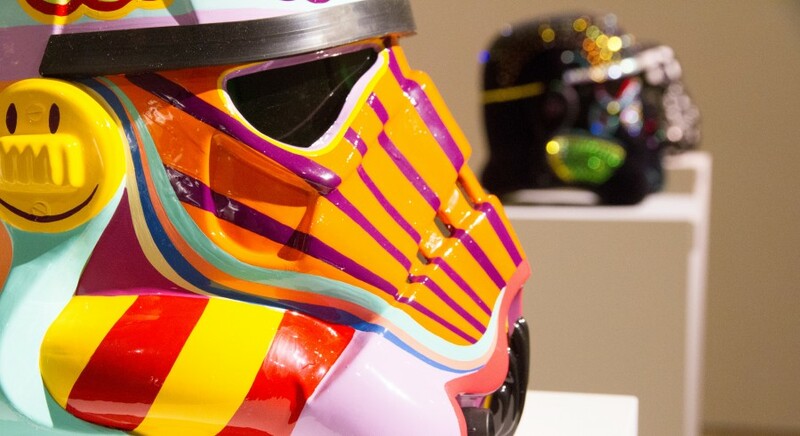 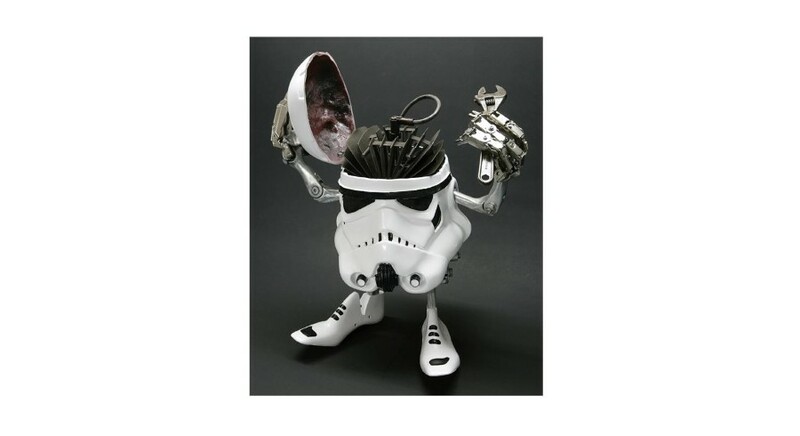 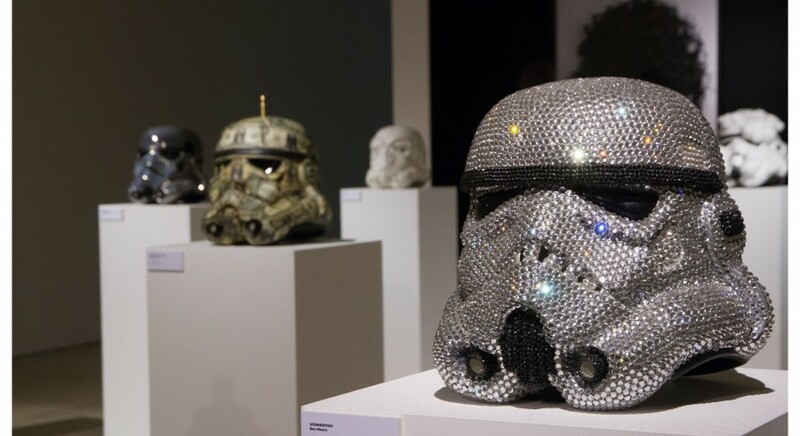 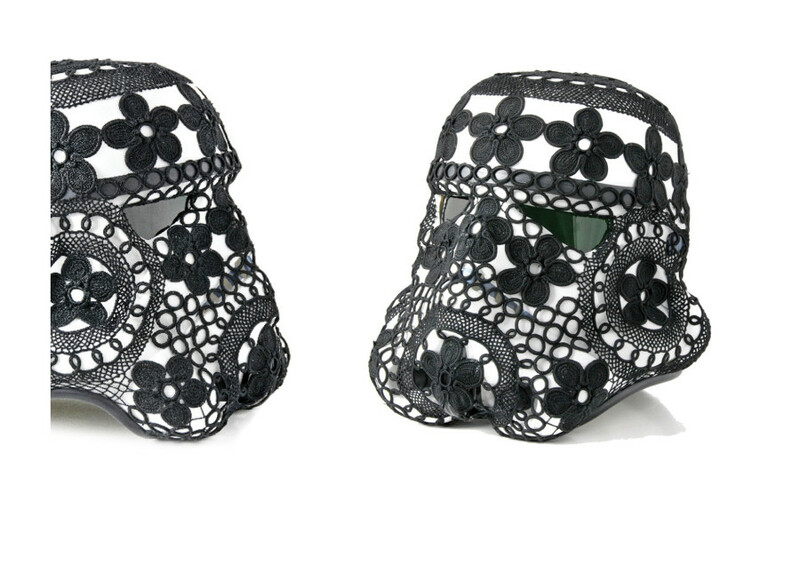 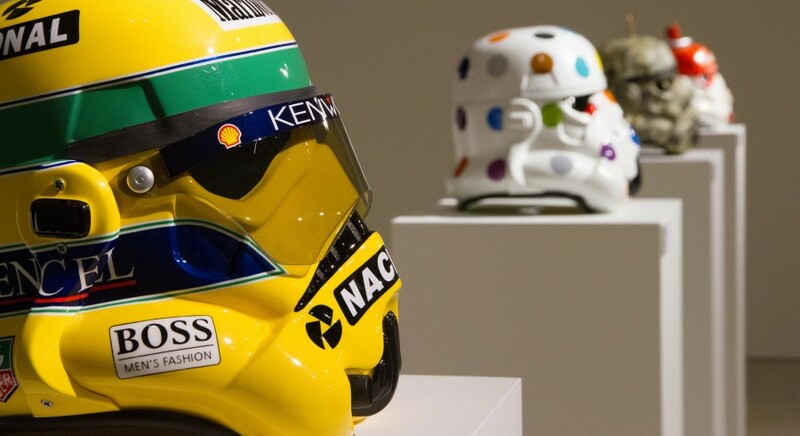 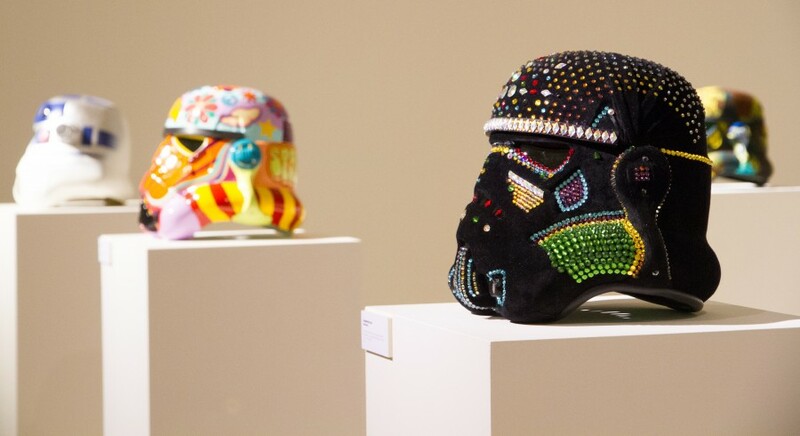 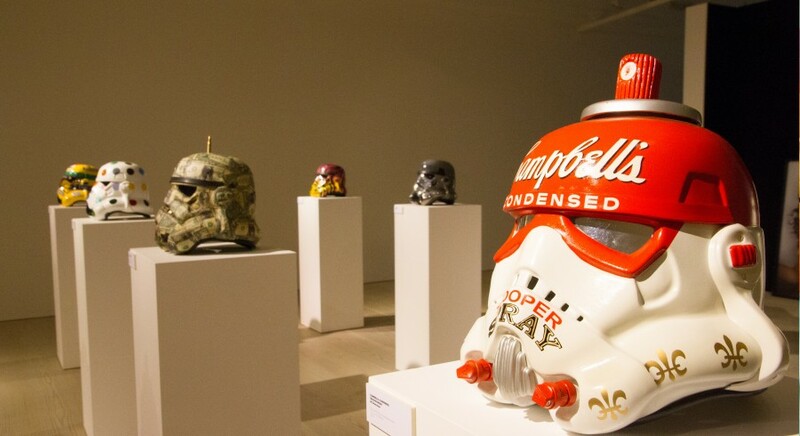 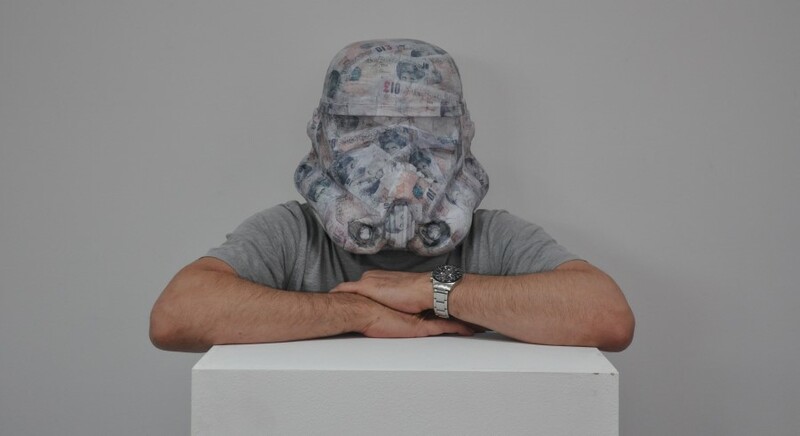 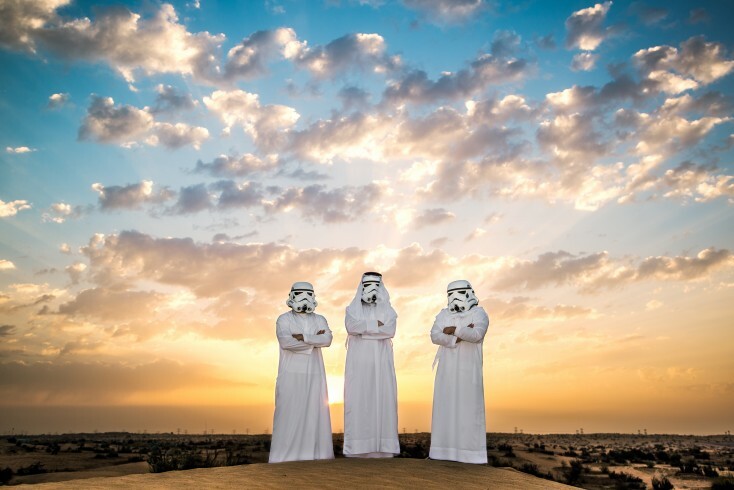 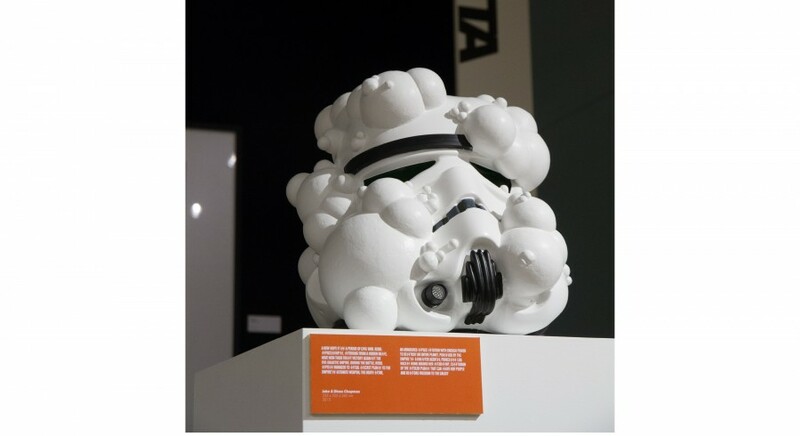 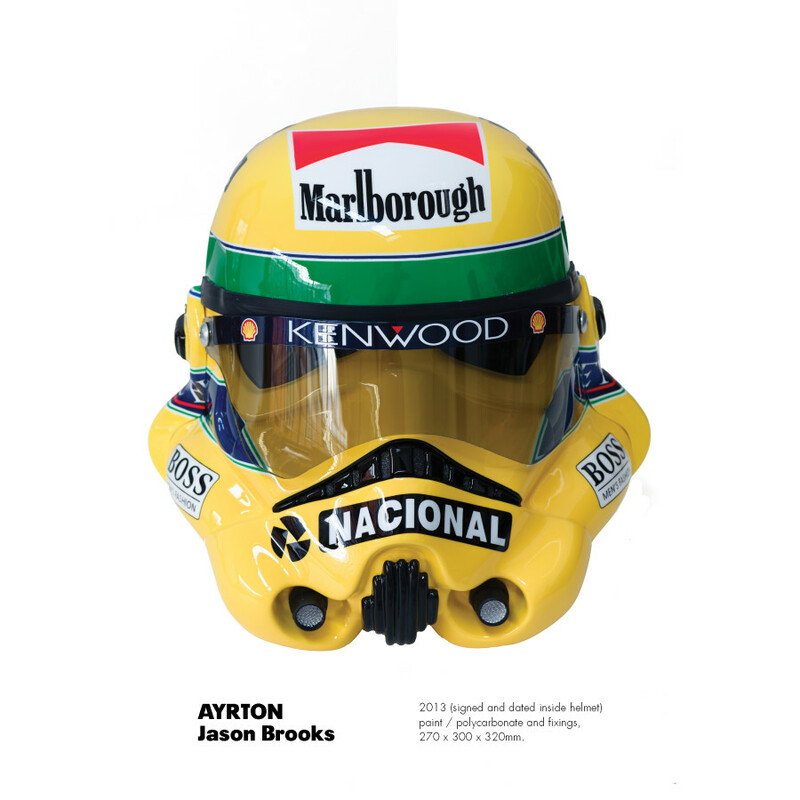 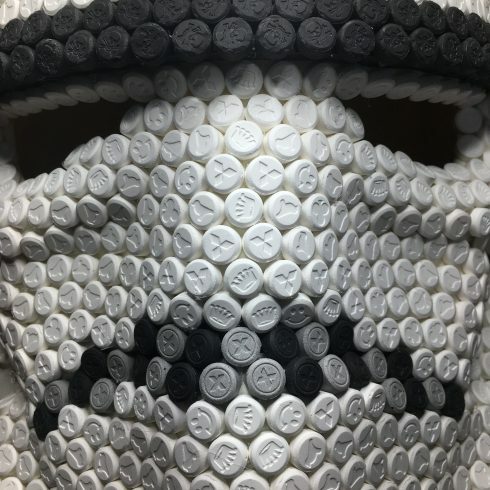 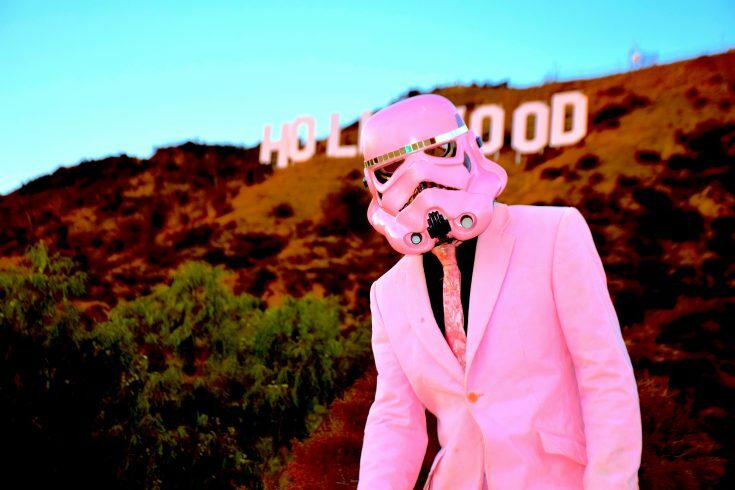 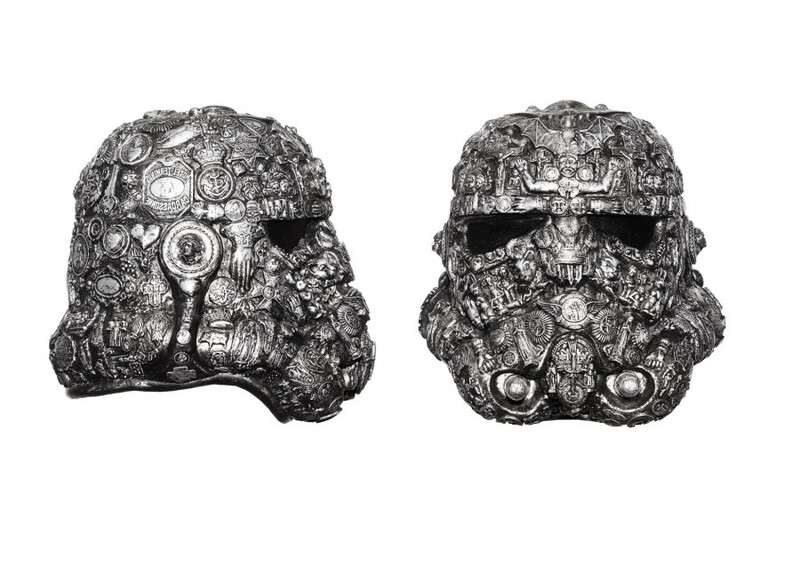 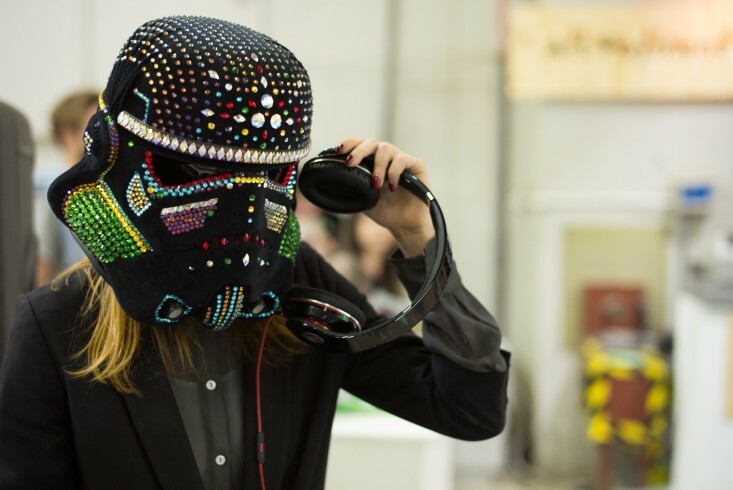 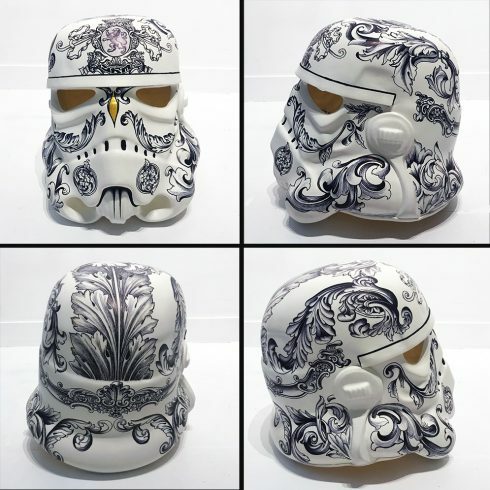 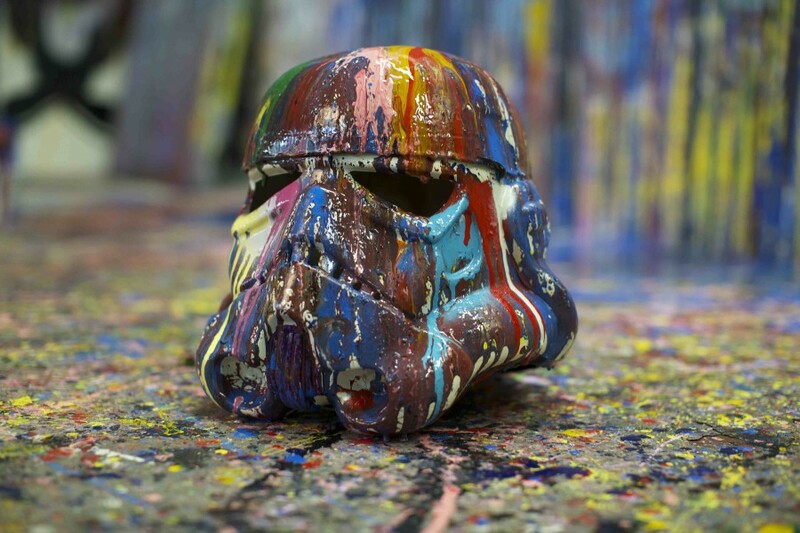 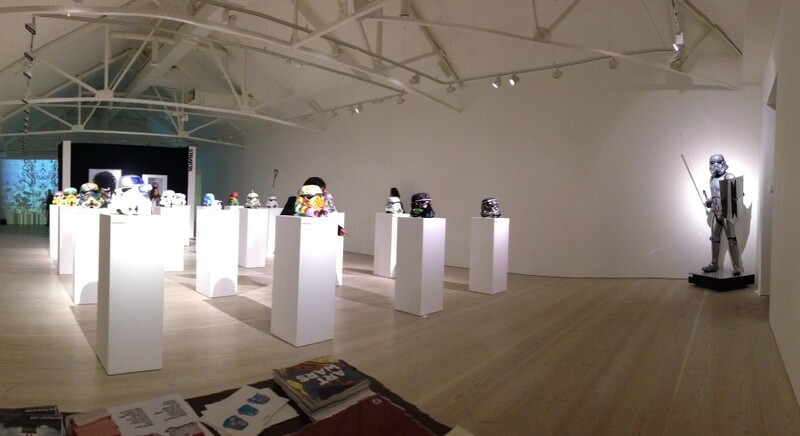 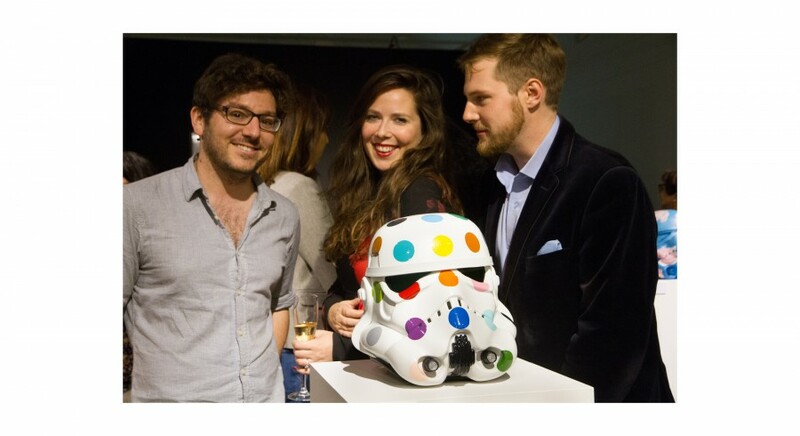 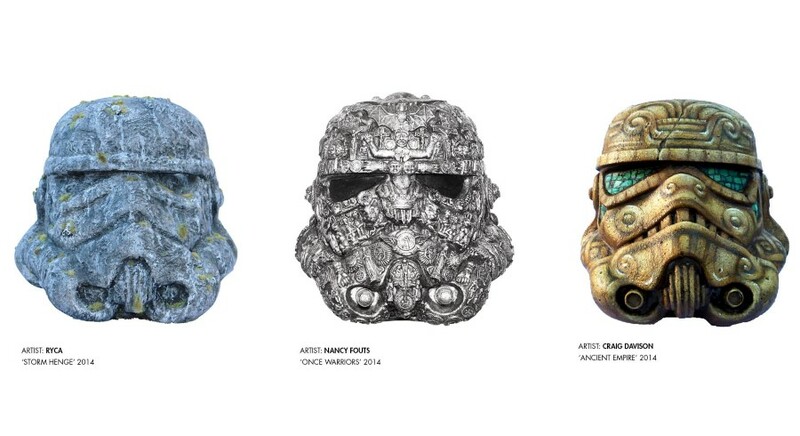 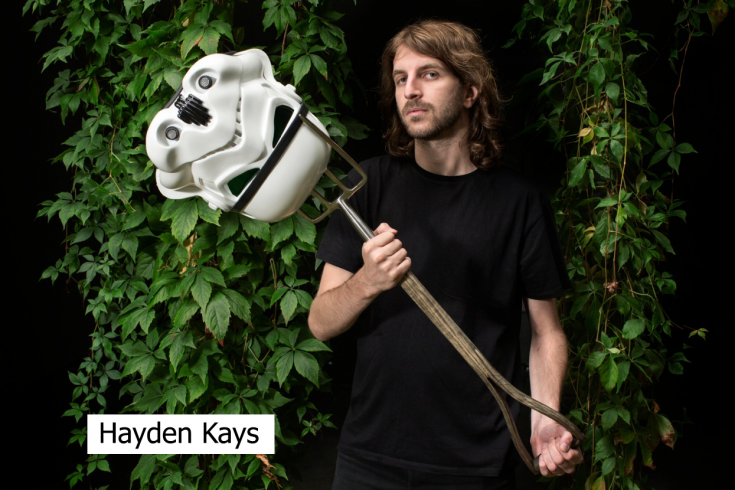 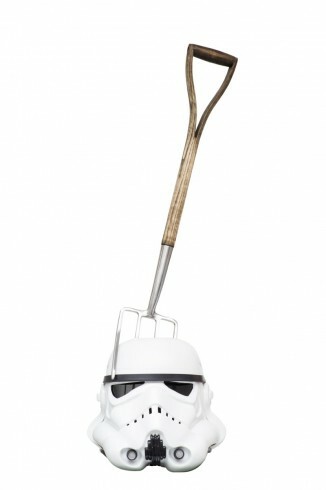 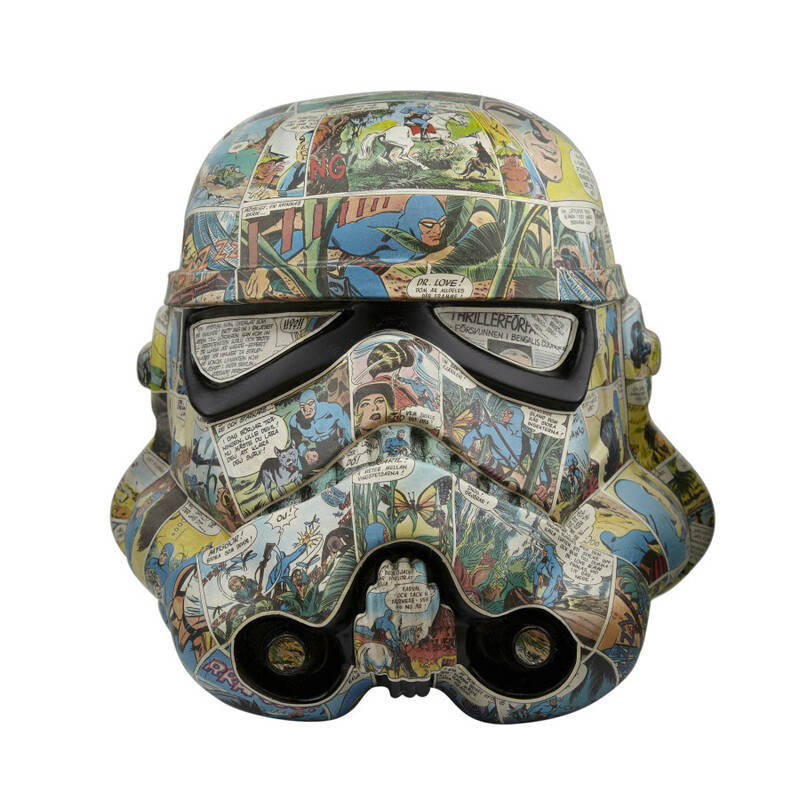 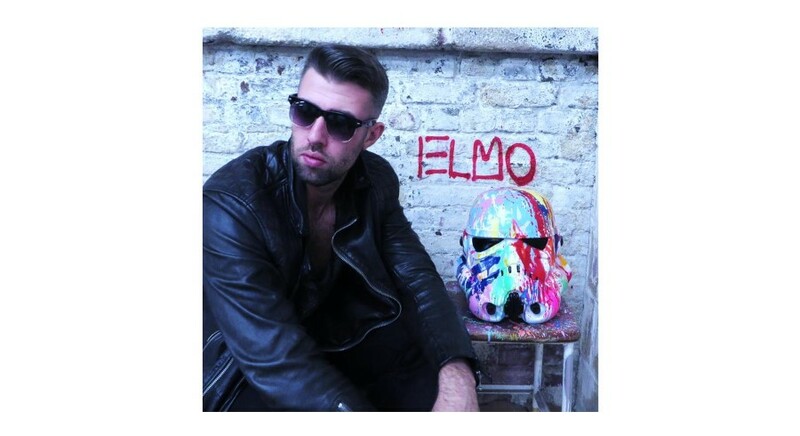 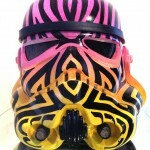 Curated by Ben Moore, Art Wars is an exhibition of Stormtrooper helmets that have been left at the mercy of some of the best the art world has to offer, including Damien Hirst, Jake and Dinos Chapman, Mr Brainwash, D*Face and Joana Vasconcelos. 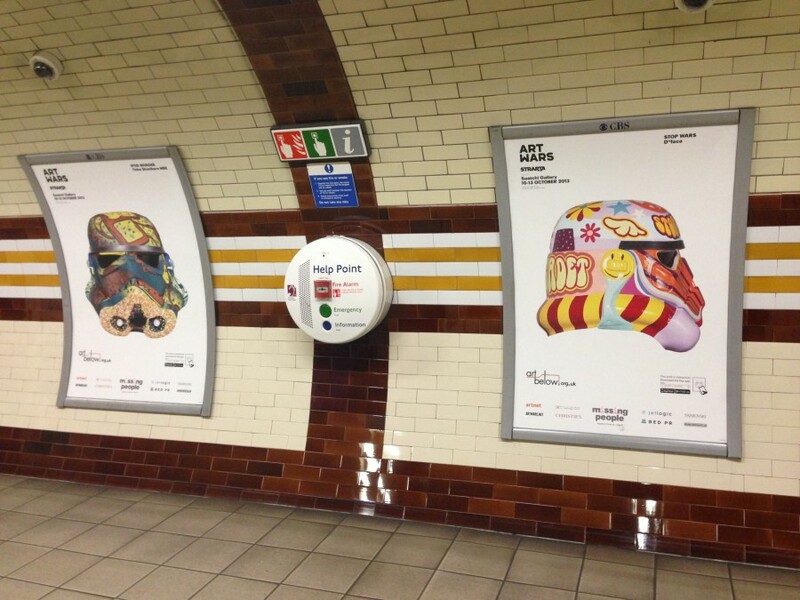 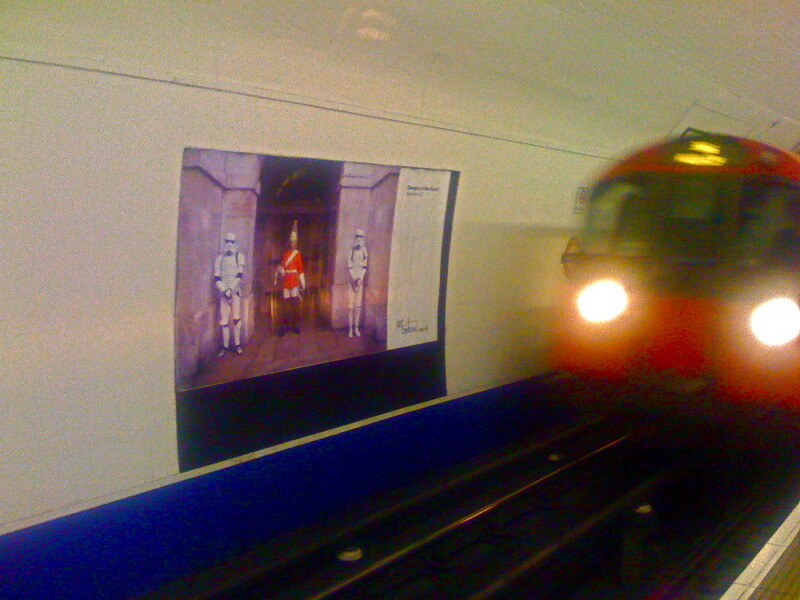 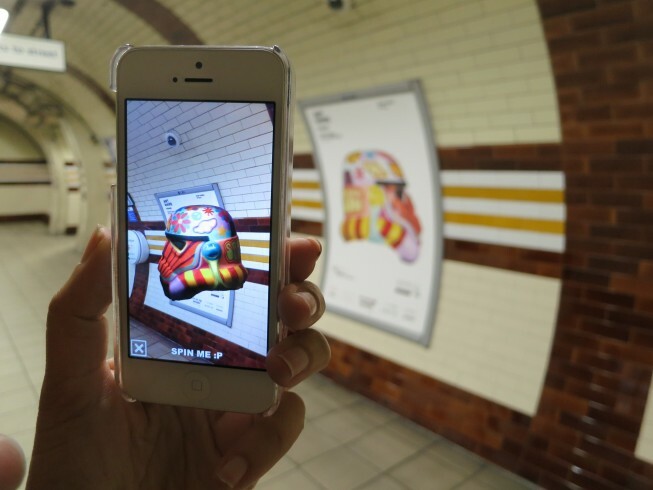 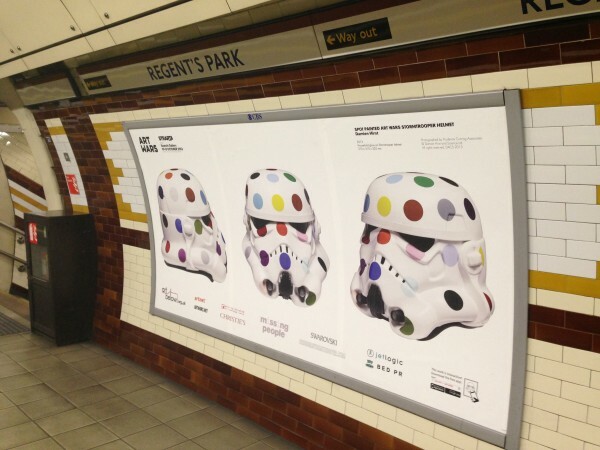 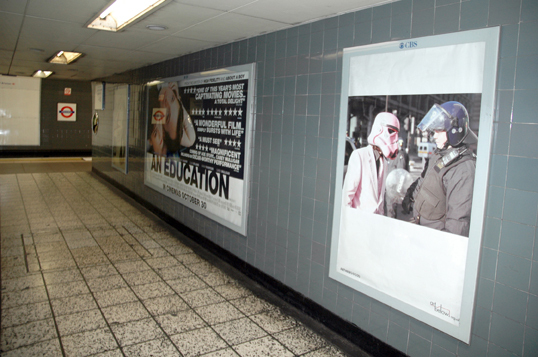 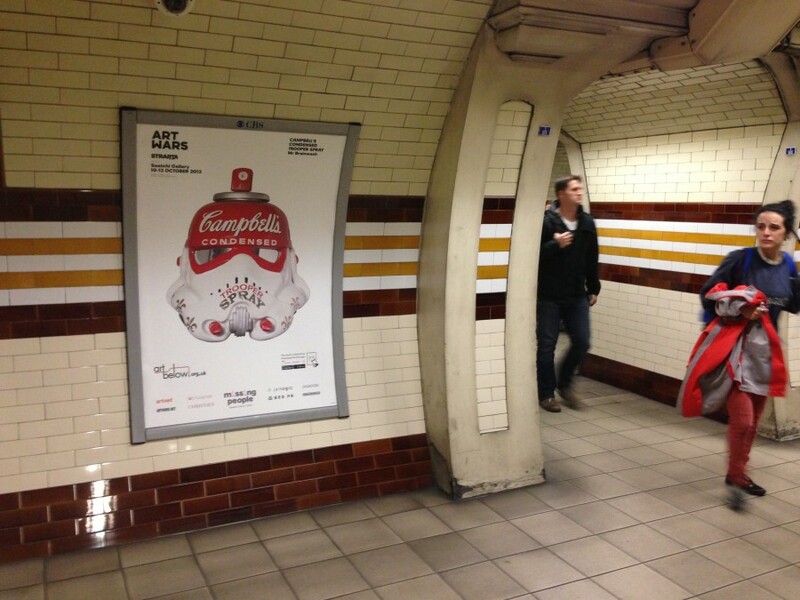 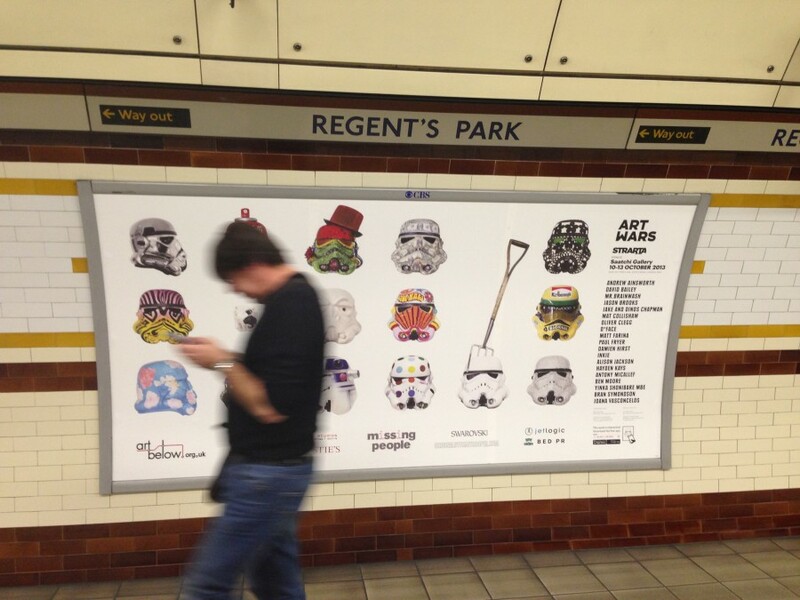 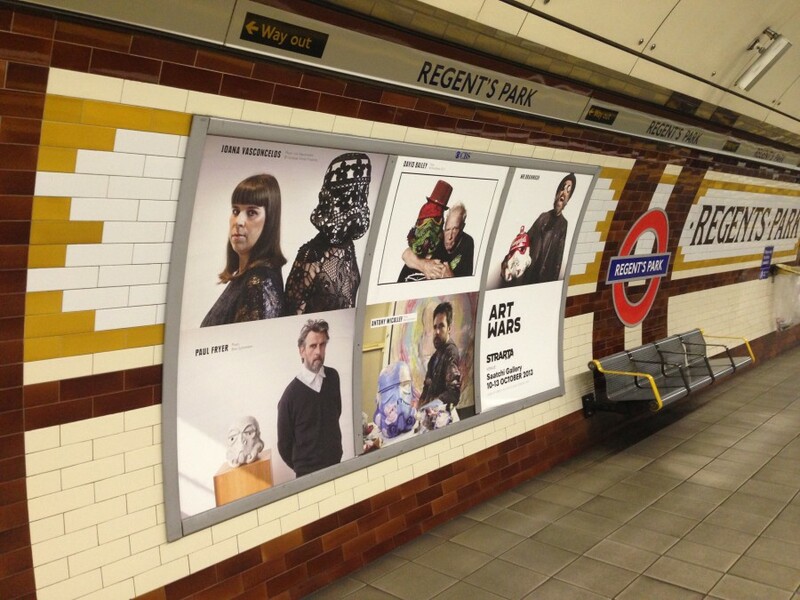 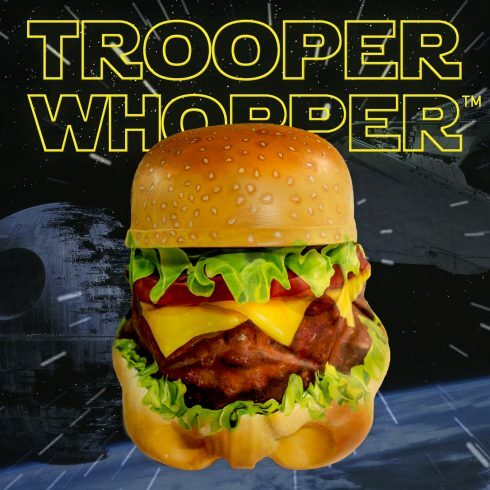 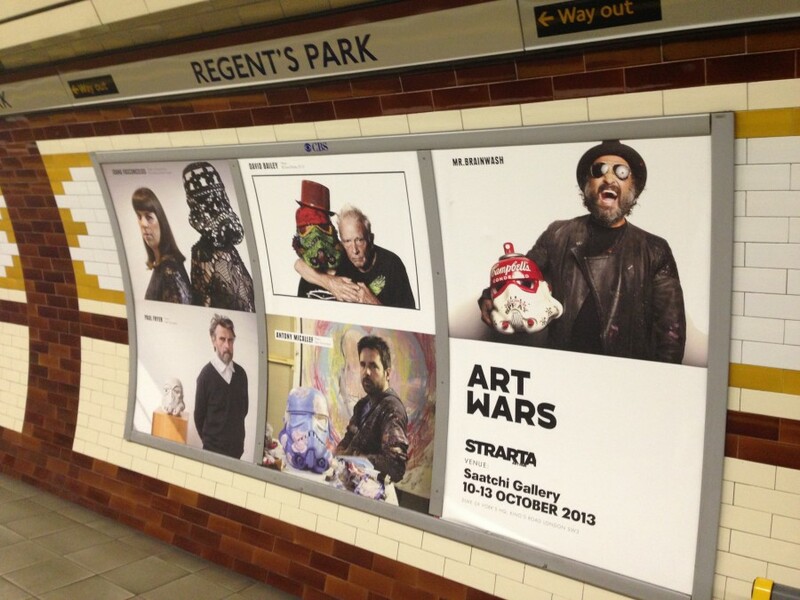 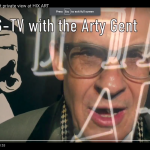 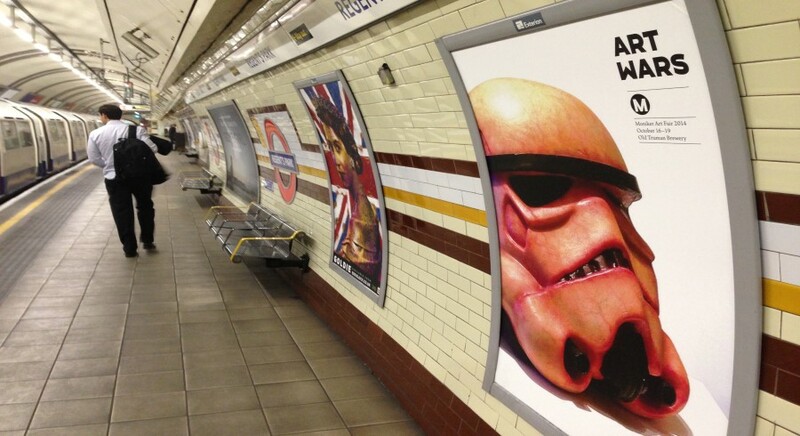 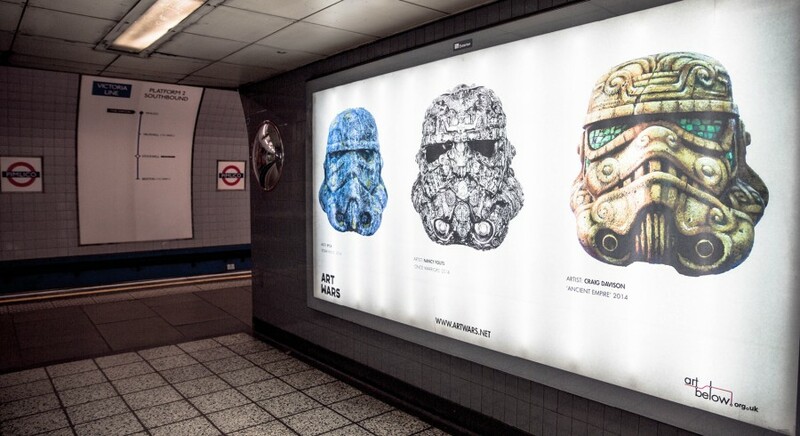 Art Wars was unveiled at the Saatchi Gallery in October 2013, and was showcased on billboard posters by Art Below throughout Regent’s Park Station for the whole month. 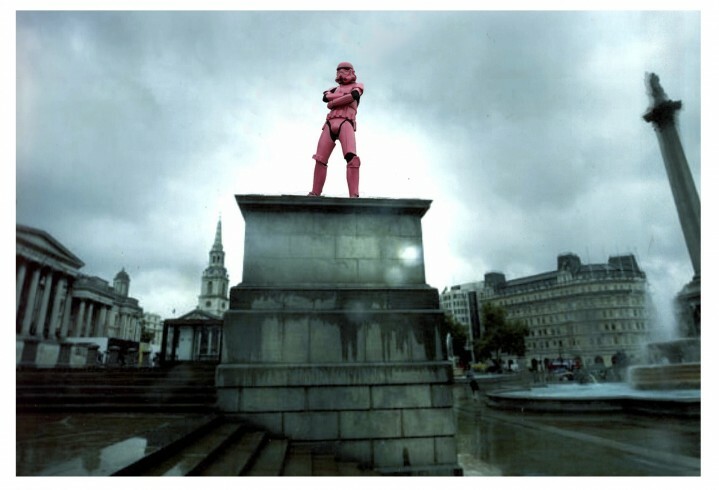 2013 marks the 10th year that Ben’s brother Tom has been missing. 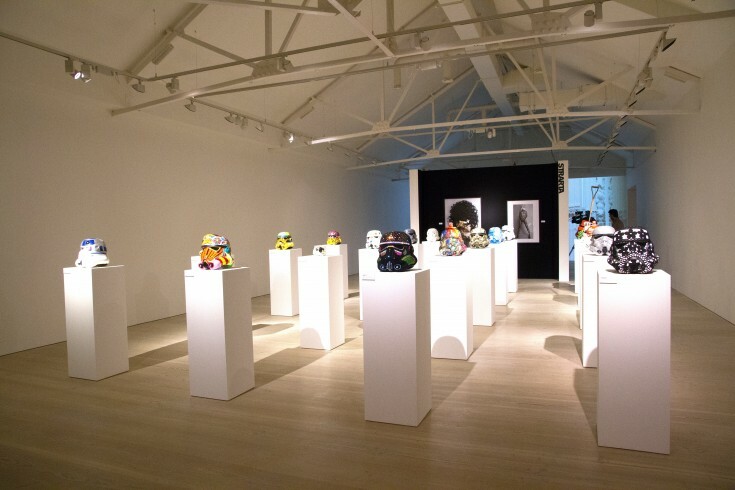 Proceeds from the Art Wars exhibition at the Saatchi Gallery and auction go to the ‘Missing Tom’ fund, which was started up specifically to raise money to support the search for Thomas Moore.